With near-capacity crowds, attendees got an overview of current and upcoming Tizen technologies and received hands-on tutorials and deep dives into the latest wearable software development kit. Hyogun Lee, executive vice president of Samsung and co-chair of Tizen Technical Steering Group, and Mark Skarpness, director of Systems Engineering in the Open Source Technology Center at Intel, kicked off the summit with a keynote in which they announced that Tizen would release Tizen 3.0 by the end of this year. This release promises, among other things, to enable profiles that will support multiple device types across the connected device ecosystem. In addition to platform news, other Tizen products such as the Tizen Smart TV were on display at the show, with launch dates expected in the near term. 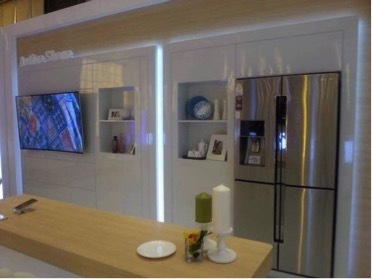 Demonstrations illustrated how users can control Tizen Smart TVs and home appliances, and additionally how to access real-time TV content using voice commands and Tizen wearables. Other news out of TDS included the continued success of the Tizen Association Partner Program, which grew to over 100 members across the app developer, operator and device maker markets with the addition of 16 new partners. The excitement and momentum around Tizen was evident throughout the developer community and within some of the most prominent Chinese companies. Liu Jun, vice president of Baidu, Xie Pingzhang, vice president of Tencent, and Yu Yongfu, CEO of the Mobile Business Group, UC and member of Alibaba Strategy Committee delivered a joint keynote at the event. 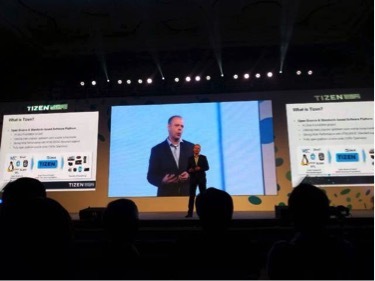 The executives discussed the value of the Tizen platform and voiced their interest in adapting services and products to Tizen’s open source operating system to create a smart, connected consumer experience. 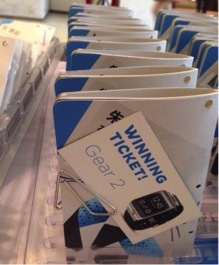 The Giveaway was sponsored by the Tizen Technical Steering Group, and meant to give developers access to the latest in high-performance wearable and ultra-compact form factor PC devices. What better way to celebrate free and open coding than with free, cool devices? Take a look at our Facebook album for more photos of #TDS14SH and make sure that you follow us on Twitter to stay up-to-date on the latest Tizen news and events.